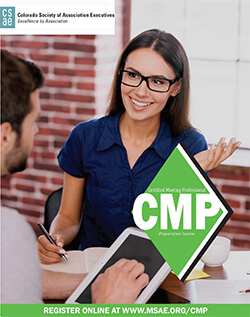 Certified Meeting Professional (CMP) Prep Courses from Michigan Society of Association Executives offer in-depth learning experiences that align with the current CMP International Standards. The 5 month interactive courses are led by a core group of facilitators and content specialists. CSAE members receive discounted rates. If a program offered by CSAE meets the requirements for continuing education (CE) credit for the Certified Meeting Professional (CMP) credential, it will be identified with the CMP Preferred Provider logo and include the number of CE credits attendees will receive for participating. Programs offered by CSAE that meet the requirements for CMP CE will be identified with the CMP Check Logo. Note: Programs identified as meeting requirements to receive continuing education (CE) credits are not endorsed, accredited, or affiliated with the Convention Industry Council (CIC) or the Certified Meeting Professional (CMP) Program. Applicants may receive CE credit for attending any program that meets eligibility requirements of the CMP Program, as there are no specific individual courses required as part of the application. Selection of eligible education is up to the applicant based on his/her needs.